Gov. Tim Pawlenty is on MPR’s Midday today at 11. I’ll be live-blogging his appearance, however I will not be in the studio so don’t send questions to me. But do use the comments to section to discuss what he has to say. I wonder if the question about higher political ambitions will come up? 11:06 a.m. – We’re underway. Gary makes mention that people are betting against the Legislature finishing without a special session. A friend of mine, fairly well placed in a department agency, says they were planning for a special session even before the legislative session began. 11:07 a.m. – “The work always fills to expand the time,” Gov. Pawlenty says. 11:08 a.m. – Gary suggests Pawlenty and Senate Majority Leader Larry Pogemiller don’t get along. “It’s not personal,” Pawlenty says. 11:09 a.m. – Pawlenty says he won’t sign a bill with a tax increase but says it’s not because of the “pledge” he took in 2002. Eichten notes that even though it’s not called a tax increase, he is proposing additional revenue. 11:12 a.m. – “In the last 24 months, there have been the largest block of tax increases in the modern history of Minnesota,” Pawlenty says. 11:13 a.m. – Governor says economic projections are not generally reliable. “Anyone who tells you they know what the state budget is going to look like four years out is not telling the whole story,” he says. 11:15 a.m. – The governor repeats his contention that Minnesota has one of the most generous health care programs in the country and it’s suffocating us. It will overtake the budget within 15 years. 11:19 a.m. – On permanent flood protection for Fargo-Moorhead. “The limiting factor isn’t state money…Minnesota and North Dakota hasn’t been the holdup.” He also says some projects in the area will be fully funded in bonding bill this year. Q: You’ve taken to chiding the federal government for deficit spending. You have a history of balancing the budget in the short run by pushing the problem into the future. How can you be taken seriously for criticizing a president who’s showing leadership? A: Minnesota has a legal requirement to balance its budget every two years. We have not been in deficit. BTW, Pawlenty did the Republican response to Obama’s weekly address this weekend. Q: Why are the roads so poor? 11:30 a.m. – Gary asks if he expects gay marriage to come up. “I don’t think so. John Marty is the chief author of the bill and it’ll take a super majority vote at the Legislature.” He doesn’t think the Legislature is interested in wading into it. 11:34 a.m. – The Franken-Coleman race. Says he doesn’t know if he’d issue an election certificate after the state court’s rule on the race. “We get asked, ‘why don’t you just sign it now?’ Minnesota Supreme Court has said it shouldn’t be issued until the state courts finish.” If it goes to the federal court? “I’d want to look at what the courts did with the case, leaving issues for appeals. I just want to make sure I have all the facts in front of me. And a state or federal court could stay the issuing of the certificate”. Pawlenty says some counties treated ballots differently. True, of course, but I continue to wonder why nobody is considering the idea of taking elections away from the counties and putting it in the hands of the state? Pawlenty says both candidates have had a fair hearing. Q: The Great Depression lasted 11-16 years depending on who you talk to. You said we have to count on a recovery and you’ve structured your budget as such, I’d like to hear specifics on why you think the economy will recover in four years? A: Our own state economist, Federal Reserve, have said the economy is going to be in recessionary mode through 2009. But they suggest it will begin to recover in late 2009 or 2010. They don’t see it as a Depression. They see a slow recovery. Q: What are your plans for long-term care? A: Everybody realizes the industry needs to change. It’s old-style’50s nursing homes. A lot of seniors want to stay in their homes, so bringing help into their homes is one way to serve them. They don’t want it to be old-style nursing homes, so the nursing home industry has to make that pivot. People aren’t going into nursing homes and living for as long as they did. Q: How can you call it no-tax increase when you cut funding to local governments and forced them to raise taxes? Elko just cut their police department. Pawlenty listed Waseca and Eagan as communities that do a good job. “What about communities who’ve already cut to the bone,” Eichten asks. “There’s a lot of data to look at. The mayor of the coalition of cities is the mayor of Wadena. He’s got over a million dollars of reserves. Have they frozen salaries? In each case it’s a little different,” Pawlenty says. 11:47 a.m. – Should kids be allowed to graduate and the grad standards relaxed to allow them to? Pawlenty says “no.” “We’re in discussion with the legislators to give them a temporary reprieve if they agree to a fix.,” he said. Q: We had tax cuts in the Bush administration and economy is in the pits. What happened? Pressed by Eichten on whether the tax cuts should have worked, Pawlenty said they’d run their course. “It doesn’t exponentially grow.” That would be an interesting discussion. Is there a limit on the benefit of a tax cut. Q: Would you like to be president? A: “I haven’t given it any thought,” Pawlenty says. Gary rightfully suggests that’s baloney. Q: If you had to choose today, would you run for re-election? A: I’m keeping that to myself. He’ll announce it late spring or summer. Q: Does Rep. Bachmann speak for the Republican Party. A: She’s passionate. She’s got strong views. She’s unfairly criticized. She does speak for the mainstream conservative movement. Q: Do you think young people will be sent off to re-education camps? A: Members of Congress have said there should be forced service. Congresswoman Bachmann may have been referring to those kinds of proposals. 11:57 a.m. – When will you meet with legislative leaders? “I met with chairs of bonding committee last week. We have a lot of legislative meetings this week. I don’t have anything scheduled with the two leaders. Part of the problem is we don’t know what their proposals are. They don’t even agree between the House and Senate. They need to finalize their work and agree with each other before they reconcile their differences with me,” he said. 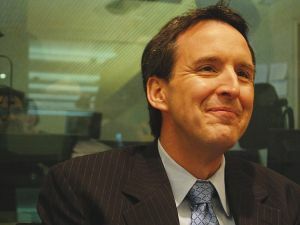 I’m torn whether we want this Pawlenty off the national media every night and weekend representing the petty right wing point of view or I want him back in the state rolling up his sleeves and ‘solving’ our problems……Comments? He hasn’t had a constructive idea in 6 years so far. His lame sophomoric jabs and finger pointing on nation talk and news shows is embarrassing. Minnesota, crazier than you think. I wonder how the Governor views the state’s commitment to children whom the state has taken away and put up for adoption. About 85% of these kids have Fetal Alcohol Spectrum Disorder and live with persistent, organic brain damage as a result. The state DHS has announced it will not fund the parent support groups that have facilitated successful adoptive placements for over a decade. The governor’s budget slashes services for citizens with developmental disabilites (halting the licensing of foster care for developmentally disabled adults for example) and describes these services as “suffocating” the rest of the state’s economy. Does the Governor think that the state’s obligation to the welfare of children removed from the biological families end with adoption? I’d love to know how the Governor proposes support adoptive families and adoptive children throughout their life-times? That’s quite a non-answer to the question about budget deficits. No follow-up? I could not find the send a question to “click on” so this will have to do. I listened as Gov. Pawlenty stated that his administration has put more money into highway funding than any prior administration. I am certain that his interpretation is accurate in his oprion. What I wonder then is given the funds spent, and the state of repair of Minnesota roads, how can Gov. Pawlenty then not admit that the administration of those funds has not been acceptable? For one who alleges that there is waste and inefficiency in government – his handling of the funds is desperately inadequate and unacceptable. Please ask him about the corn ethanol boon-dogle? The biggest de-bunkers of this government subsidized and state tax exempted scam are from our own U of M College of agriculture. It takes more energy and money to produce ethanol than you get out, it’s a scientific fact for those of you who are “entitled to your opinions but not your own facts”. It’s also a major contributor to ground water depletion and water contamination from the fertilizers and herbicides needed to grow corn, one of the worst crops when comparing energy input to output. Also, how many of these ethanol plants are now bankrupt and being sold for pennies on the dollar in the Midwest. Anyone remember all those Verasun groundbreaking ceremonies the governor always touted as the future of energy? On local taxes – how can he say that “everyone’s” inflation is less than 3.9% just after describing the runaway cost of health care expenses? The soaring personnel expenses of cities and counties are pressurized by the cost of providing health care to city/county workers and their families. OMG! That was a great question! Jindal Pawlenty 2012 presidential tcicket! The Dems would absolutely love that! I’d like to see media followup on this claim. I don’t recall him making the claim before this year. Two significant recent changes come to mind: an enormous amount of money spent on replacing the 35W bridge and the Lege’s override of the Gov’s veto on raising the gas tax. Question: do the Governor’s calculations include either or both of those budget events? The treatment of the 4(?) republican legislators who voted for the gas tax increase, or in the case of Erhardt, who I think championed and introduced the bill was appalling. Just wait until you hear about the new crazy idea to charge Minnesotans by the mile. It’s a complex system of lever and pulleys that’s going to track your mileage driven and charge you accordingly. Another complicated Minnesota (the ‘kick me’ state) solution to a problem that doesn’t exist. Legislators have this huge collective delusion in this state of not trusting the public to know what a tax is. Somehow the self regulating gas tax that penalizes people with low mileage vehicles and rewards high mileage vehicles all by the miracle of simple math isn’t complicated enough for Oberstar and some other local and national legislators. You could do a whole program on this scheme alone. Is Minnesota really a democracy? What is the difference between Pawlenty using his veto power and Minnesota being governed by a monarchy? There’s really no comparison between Pawlenty and a monarchy. The secret isn’t Pawlenty; it’s the ability of the Republican caucus in the House and Senate (but mostly in the House) to stay united. It’s up to the DFL to convince Republicans to support something they’re proposing. Pawlenty would have absolutely no power if the House Republicans were not so united. Is that a round-about way of saying that tax cuts don’t work? I think there should be a show(s) on this topic of what tax cuts actually do. What is the long term affect of tax cuts? I have yet to be convinced that tax cuts do much of anything other than excellerate the direction people are moving, poor getting poorer and rich getting richer. Fully funding early childhood education, healthy citizens, good roads etc would appear to have a longer course than the fewer than 6-8 years Pawlenty said the Bush tax cuts had. This governor has raised thousands of new taxes. He’s raised excise taxes on every medical bill, prescription drug, medical insurance policy, various other excise taxes, license taxes, sales taxes, and property taxes. When he pathologically lies about having no new taxes, he means no taxes that he has to pay any significant amount of. When he talks about tax cuts, he means tax loopholes for big business that ships jobs overseas, and tax cuts for land speculators who got loans with no appraisals, built a couple townhouses, and then lost all the money they borrowed. And why does the interviewer always agree with him when he says there were tax cuts? Doesn’t he know what a tax is? I am also very interested in the Gov’s claim that tax cuts may have “run their course”. To me, this seemed to say that you get a short term “bump” from a tax cut, similar to a bump you get when you implement an “accounting shift” (like the one proposed for education – delaying part of the payment till the next budget). Although a tax cut may have longer lasting benefits than a 1 time bump that accounting shifts provide (1 year or 1 budget cycle), perhaps the 5-8 years of maintaining tax cuts have exhausted their benefit. Would it not make sense to re-establish tax levels to pre-tax-cut levels (not a NEW tax, just a return to previously established levels) SO THAT the government could, down the line, have that tool in the tool box again? I agree with a previous poster that a whole show could be done to try and educate folks on this theory that tax cuts can actually increase revenue and stimulate the economy. Since Pawlenty says tax cuts are merely “bumps” for the economy and not long term stimulous, shouldn’t that theory be criticized the same way the Republicans are criticizing Obama’s job stimulous plan — that the job creation is not effective because it will be “short term”? If tax cuts are merely short term stimulous, and short term stimulous according to Republican views do not work, then it should not be implied that tax cuts provide long term economic growth. Pawlenty should be made to explain this inconsistency. then he says ‘HIS” economic advisor is reliable. Just wait until you hear about the new crazy idea to charge Minnesotans by the mile. Actually, it a weight/distance tax that has been working very well in Oregon for many years. Lets not just repeat the non-information out there until they actually introduce the bill. Tax cuts do run their course, like anything over time. What a tax cut actually accomplishes has to be looked at over that period of time. First, the tax cut reduces the amount the govenrment has available to spend from the funds on hand. It does not automatically reduce spending, it just reduces the amount for which the governmnet can pay with cash on hand. That means the government borrows more, even in a state with a balanced budget requirement (for example you do more bonding for highway and capital projects). Borrowing means you pay interest, which means you end up paying more in the long run (even the net present value of the stream of payments is more). The interest (which we could call “skim”) goes to the lenders (aka banks, Wall Street, the Saudis, the Chinese, etc.). At the same time, the pool of capital available to borrow is reduced, so everyone else (home buyers, small businesses, etc.) gets to pay higher interest costs. Those higer costs get passed on to consumers, what we call “inflation”. Inflation increases tax revenues and implicitly devalues the amount the governemnt owes on what it borrowed, so the goverment and other borrowers do get a break on their payback. However, we are all left paying higher costs for goods, too. So in the end, tax cuts benefit the people who got the biggest part of the cuts, and the bankers and others who loan out money to the government and others. The rest of us pay higher interest, higer costs for goods, and in the end pay a higher amount in long term taxes for waht the governemnt spent. Again, this isn’t dependent on spending levels, this is simply what happens if you have some fixed level of spending and you decide to put of paying for it by having a tax cut now and borrowing money to make up the difference. So a tax cut without a spending cut simply makes the spending more expensive in the long run, drives up other costs for consumers, and allows the government to pay banks, Wall Street and foreign investors. So I would interpret Governor Pawlenty’s comment that the tax cuts have run their course to reflect that all of the money from the US treasury has indeeed been transferred to banks and Wall street in such a manner that it requires massive deficit spending and borrowing, which ensures further interest payments to banks, etc. for decades to come. He’s right, the tax cuts have fully accomplished exactly what they were intended to do, take the tax revenues and transfer them to the bankers. The weight of your vehicle should be taken care of in your Tab/license fees. At least it used to be until Ventura basically created a flat fee for Tabs eight years ago. Requiring 4 million Minnesotans to equip their cars with mileage tracking equipment costing 100’s of dollars is insane. The simple solution is always the best. What happens when I drive to Greenbay? Do I now have to file another schedule on my tax return to claim the 300 miles I drove in Wisconsin? Another case where the gas tax works perfectly I might add, Wisconsin gets their share when you fill up your car in Greenbay to drive home….. Everything taken care of sans government spy satellites and spy cameras. Sandy how about championing something useful in Minnesota? i said it before, probition is coming just in a more delicate form. they will never be happy for any level of alcohol….. there should be thousands of people ot there vying for your money to give you a ride home, myself i think the insurance companys make it impossible to do that because of liability……work hard,..play har…ooops ,just go home!